Approximately 350 to 400 children under 5 years of age drown in pools each year in the United States and another 3,000 are treated in hospital emergency rooms for near-drowning incidents; most of the cases involve residential pools. In some states drowning in the family pool is the leading cause of accidental death for children under 5 years of age. Nationwide, drowning in swimming pools is the second leading cause of accidental death for children under 5 years of age. For years the problem of children drowning in backyard pools was ignored except by those families who suffered from this accidental tragedy. In the early 1980s, the U.S. Consumer Product Safety Commission (CPSC) began a safety awareness campaign about pool safety, which is still very active today. The commission has also issued guidelines as to the combined use of layers of protection to reduce drowning in pools. The proposed ASTM model barrier code is of utmost importance in that it calls for the use of safety devices for pools that meet national standards. The only way to prevent accidental drowning is the use of safety devices in a “layer of protection” approach, which is advocated by all concerned drowning-prevention entities. State and local governments are passing or considering passing legislation (“barrier laws”), to make pools safer for children. These governments need guidance on which safety devices to use in their legislation. Without national standards this legislation will falter or be poorly written. This is why the need for national standards is paramount. (a) The pool must be isolated from access to a home by an enclosure. 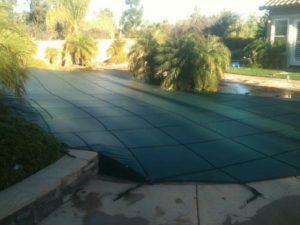 (b) The pool must be equipped with an approved safety pool cover. (d) All doors providing direct access from the home to the pool must be equipped with a self-closing, self-latching device with a release mechanism placed no lower than 54 in. [137 cm] above the floor. The intent of this statute is to prevent drowning but it lists only one standard for enforcement agencies to follow and that is where the problems began. The interpretation of the statute was left up to the Florida Building Commission (FBC), which changed wording and, in some instances, the original intent of the legislation. The FBC only cited two standards — ASTM standard F 1346, Performance Specification for Safety Covers and Labeling Requirements for All Covers for Swimming Pools, Spas and Hot Tubs, and Underwriters Laboratories standard UL 2017 for residential water hazard alarm equipment. If the FBC, after citing the national standards, would not have added their own language the new statute might have been painless and successful. After citing UL 2017, they required the door alarms to be hard wired (no battery alarms allowed) and to sound immediately. There were no alarms on the market that could meet this language. All the alarms already being used were battery operated and sounded within seven seconds, which meets UL 2017. 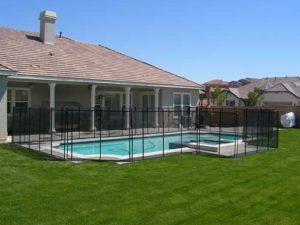 Another problem with the statute is that it allows for an approved safety cover as one of the layers of protection the pool owners can use instead of a fence. The statute refers in this one case to the ASTM standard for safety covers. The problem is that not all safety covers that meet the ASTM standard are recommended as a permanent layer of protection for a pool. Only power operated, and not manually operated, safety covers are recommended by ASTM and the CPSC. Again, without proper guidelines, the legislature allows for manual safety covers, which for the most part are winter covers for pools. Manual safety covers meet ASTM safety standards but they are not considered a permanent layer of protection for pools to prevent drowning. Adding language to a national standard — which is basically what the FBC did — can and has caused uproar, confusion, and eventually lawsuits against the FBC. If a government entity is going to cite a national standard, and they should, then they should follow that standard and not change the standard. The basic reason behind national standards is for uniformity of language as well as safety and performance requirements. If the Florida legislature had an ASTM model barrier code, much, if not all of the confusion could have been avoided by incorporating the ASTM standard into their statute in the beginning. This would have made for a much more comprehensive and uniform law. In California, barrier laws have been around for some time in certain parts of the state. All were problematic because there were no standards for the local jurisdiction to follow. Finally the state passed a state wide barrier requirement for pools, which was eventually used by Florida as the basis of its law. 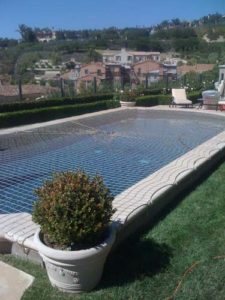 The California statute also calls for the pool owner to have in place one of the four layers of protection at a residential pool, but it does not cite enough national standards for different layers of protection. Like Florida, California could have really benefited from the proposed ASTM model barrier code on barrier requirements. In 2001 a bill was introduced to the California Legislature to increase the layers of protection choices from four to six. The new law would require the pool owner to have two instead of one layer of protection devices in place, but they could now choose from a menu of six instead of four options. The two new options added were removable barrier fencing and pool alarms. The opponents to the bill quickly jumped on the fact that there was no national standard for removable barrier fencing. While there is an ASTM standard for pool alarms, ASTM F 2208, Specification for Pool Alarms. Having no standard for removable fencing helped stall the bill, which will be introduced again next year. ASTM is working on a national standard for removable barrier fencing, which is necessary for the success of the bill. In order for this bill to pass and be properly written, the ASTM model barrier code is essential — just as the standard for pool alarms and the fencing is essential. Some entity has to be responsible for giving states guidance in the development of model barrier codes and providing standards for the different layers of protection in those codes. ASTM and the CPSC have accepted this challenge and are working very hard to complete their task. Will national standards make pools safer and prevent accidental drowning? This is a complicated issue. The pool industry for years has preached that adult supervision is the only way to prevent drowning. Adults do supervise their children — some better than others — but these tragedies are accidents. “Accident” is the key word in describing drowning tragedies, and understanding this is where the philosophical approach to their prevention lies. There must be layers of protection between the child and the chance that they might drown. The pool industry, drowning prevention groups, governing bodies and so forth are working separately and in different directions. In short there are many drowning-prevention entities with good intentions along with opposition groups fighting them every step of the way. Somehow all this energy must be harnessed into preventing the problem, and the interested parties need to get organized. The development of a coordinated, strategic approach is key to preventing accidental drownings. The proposed ASTM Standard Guide for Proper Use of Safety Devices for Prevention of Drowning or Entrapment in Residential Swimming Pools, Hot Tubs, and Spas (Model Barrier Code), provides a way of becoming organized. It is a comprehensive outline, guide, and plan for preventing childhood drowning and entrapment. All the different layers of protection described in the ASTM guide have a national standard for expert objective guidance and reliability in their use. Once this task is complete — and it will be completed by ASTM and the CPSC soon — the next step is education. State and local governments must be made aware of this comprehensive standard and use it in writing laws that will protect children. There are many opponents to legislating safety but safety legislation works and can protect those who cannot protect themselves — small children. Standards are the key to saving lives, and will help in the prevention of children drowning in pools. Merle I. Stoner is the founder and president of Poolguard, North Vernon, Ind. He was chairman of the ASTM subcommittee that developed the standard for pool alarms, ASTM F 2208. He is a member of ASTM Committee F15 on Consumer Products. Examples of ASTM Certified Pool Safety Products. If you have questions about preventing kids from drowning please give us a call. It’s easy to get a FREE estimate for your Pool Guard pool fencing, net , or cover.